Xiaomi has today announced the higher end version of Redmi Note 4 that comes with 4GB RAM and 64 GB internal storage. 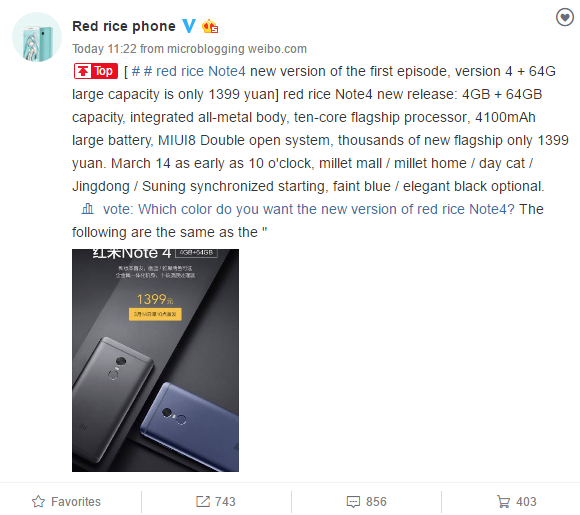 The move from Xiaomi may be attributed to enhance the sales of Redmi Note 4. The device has been released last year and yet a make its mark in sales figures. Redmi Note 4 is the successor to Redmi Note 3 which witnessed a huge popularity and recorded high sales figures making it the most successful Redmi series smartphones till date. The new high-end version comes with 4GB RAM and 64 GB internal storage and comes with a price tag of 1,399 Yuan ($202). If you look at the earlier versions Redmi Note 4 was available in two variants. One variant came with 3GB + 32GB storage and was priced 999 Yuan ($144). The other variant with 3GB + 64GB was priced at 1199 Yuan ($173). The high-end version with additional 1GB RAM is only 200 Yuan higher than the earlier versions. 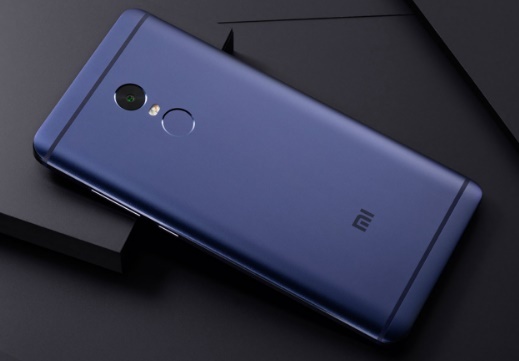 Apart from the RAM, storage and price the other specifications of the high-end model are similar to the earlier Redmi Note 4 versions. 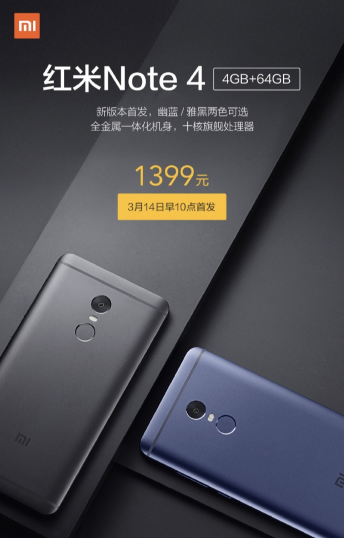 The high-end Redmi Note 4 will go on sale tomorrow i.e March 14 and will be available on Xiaomi Mall, Mi Home, Jingdong (JD.com), Lynx and Suning at a price tag of 1,399 Yuan ($202). Currently it will be available only in china and there is no information regarding the availability of device for international buyers.